Chris Beacom made the move from second base to shortstop his senior year of high school. His coach at New Trier High thought the move had gone smoothly, according to The Chicago Tribune. "You always have that in the back of your mind that the transition will cause problems, but so far, Chris has handled it very well," coach Ron Klein told The Tribune. "In fact, I think he even likes it." Beacom eventually made other kinds of transitions, to college and then to the pros. In the pros, he focused on other positions, first base and third. He played two seasons. He never made AA. 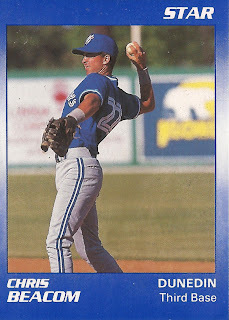 Beacom's pro career began in 1989, taken by the Blue Jays in the 40th round of the draft out of Northwestern University. At Northwestern, Beacom hit .327 over his first three years and won third-team all-conference in 1988. He hit .365 that year and captained the team the next year. He started with the Blue Jays at short-season St. Catharines. He hit .247 over 71 games. He also hit four home runs and knocked in 24. He moved to high-A Dunedin for 1990. He got into 84 games that year, but hit just .227. That season also marked the end of his professional career. Beacom soon found himself back at New Trier as an assistant coach. He then took over as head coach in 1995. He stayed in that post two years, until he left to try his hand at being an agent. In 2005, he founded and created Illinois Baseball Academy in Northfield. He has since grown the business to serve more than 2,000 children age 4 to 18, according to the academy's site.